Although you’re unlikely to find the definition in most dictionaries, proscenophobia can loosely be defined as stage fright. It is also the name of Theatre Aurora’s latest play, which is set within a play. Written by Bettine Manktelow, it not surprisingly based in the dressing room of a theatre, where the entire play takes place. The story revolves around a company of performers, who are nearing the end of a tour of what is agreed by all to be a not so great thriller. Everyone’s tired and their nerves are frayed from both being on the road for so long, and from no one having any work lined up when the show will soon be over. There’s also a bit of friction based on the history between some of the characters. But there may be some light on the horizon as the understudy finally gets her big break, and a new investor may step in to save the day. That is, until one of them dies during a performance under mysterious circumstances. Was it an accident? Was it murder? Who has a motive? Or perhaps, who has the best motive? You’ll be left guessing until the final scene. 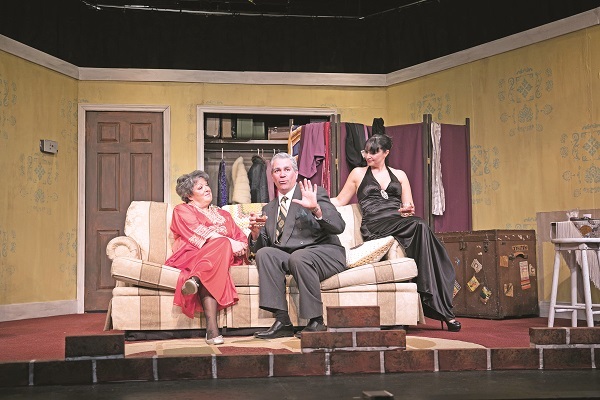 The first act spends time introducing the characters and their inter-relationships. Things pick up speed in the second act where accusations are raised and proverbial fingers start to be pointed. The six member cast do an excellent job with each of their characters. Gerri Sefi, Kirsty Campbell and Karen Geoffrey portray the jaded and often bickering cast of the play within a play. Jamie Sherman and Tracy Mckay have the roles of the long suffering, but crafty members of the stage crew. Imre Szabo portrays the ex-husband of two of the cast members, who is not averse to shifting allegiances his to support his own agenda. This is an interesting whodunit, with a few twists. Don’t be afraid to see it. Evening performances of “Proscenophobia” continue at Theatre Aurora, 150 Henderson Drive, January 24, 25, 26, 31, and February 1 and 2, with a matinee January 27. Information and tickets are available through the box office at 905-727-3669.